You don't want to miss this year's basketball pep rally and concert event! 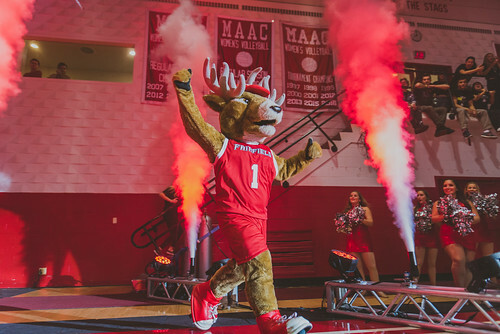 On Friday, October 12th in Alumni Hall Fairfield University Student Association will host Red Sea Madness, Fairfield’s Basketball Pep Rally and Concert Event. Red Sea Madness is an exciting night for Fairfield students, especially for our Men’s and Women’s Basketball teams. Stags in the stands of Alumni Hall will cheer on our basketball teams with the help of an MC, a DJ, and of course Lucas the Stag! Attending this event is not only a good time filled with dancing and celebration, but it is a chance to support our athletes and show our Stag pride! Last year saw record attendance for Red Sea Madness, with over 1,900 attendees and 2,200 tickets sold! This year, we aim to beat that record by having even more Stags come out for the event. Our cheer and dance teams will animate the crowd by sharing their routines, T-shirts will be thrown into the crowd by our athletes, and there will even be a half-court shot challenge where a crowd member is given a chance to win a prize by making a shot from half-court. If all of that doesn't get you excited, tickets include access to food trucks from Colony Grill, Super Duper Weenie, and Garden Catering, so you will have access to some of the best-loved food in town without having to leave campus. Of course, Red Sea Madness is not just a pep rally, but also Fairfield’s Fall Concert. This year, DNCE is the featured performer — a band with hit singles such as Cake by the Ocean and Toothbrush! For those of you not familiar with DNCE, the band’s lead singer is Joe Jonas... so, Jonas Brothers fans will not want to miss out on this concert. Aside from being a pep rally and a concert, Red Sea Madness is an event that allows Fairfield students to come together and have a good time — dancing, celebrating, and enjoying time with their friends. Tickets for Red Sea Madness are on sale now for $45 for students and $50 for 18+ guests of Fairfield students and alumni. You do not want to miss out on this event! Tickets are available on tickets.fairfield.edu. Tickets are available on tickets.fairfield.edu.